There is a vast variety of bow builds in Path of Exile, and many of them share a common flaw — they struggle to deal with the toughest bosses, and they get slapped around in difficult maps. This build is the answer; sporting excellent clear speed, absurd single target damage, the unique kiting a bow build provides, and a healthy Life pool to ensure you can tackle any challenge without fear. Our Elemental Hit Ascendant is a unique and interesting twist on the conventional bow builds floating around the game, and will empower you to take on some of the game’s most deadly encounters. Although this build is not suitable as a league starter, there are a variety of investments that you can make throughout the league to produce an indestructible exile that can find success in virtually any environment. 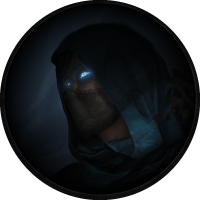 Fortunately, Scion is the most flexible of classes, and our chosen Ascendancy points are suitable for a variety of popular leveling skills, should you wish to play this character from day one. Once this character starts coming into its own, you will have little trouble dispatching some of the game’s most lethal, such as the Guardians, Uber Elder, and Uber Atziri. 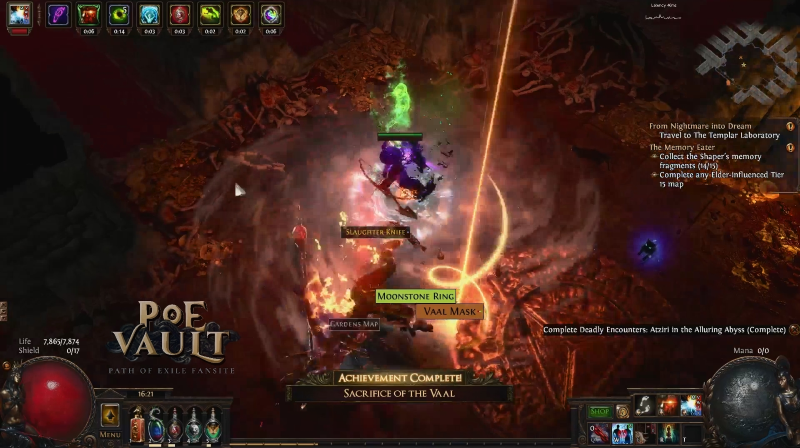 There are few builds in Path of Exile without blemishes, but we feel this is one of them. This build clears through all maps without any issues, even on minimal gear. The ridiculous amount of Life Leech we can acquire, combined with the gratifying Slayer overleech, ensures that we rarely feel in danger, even against the toughest opponents or map mods. 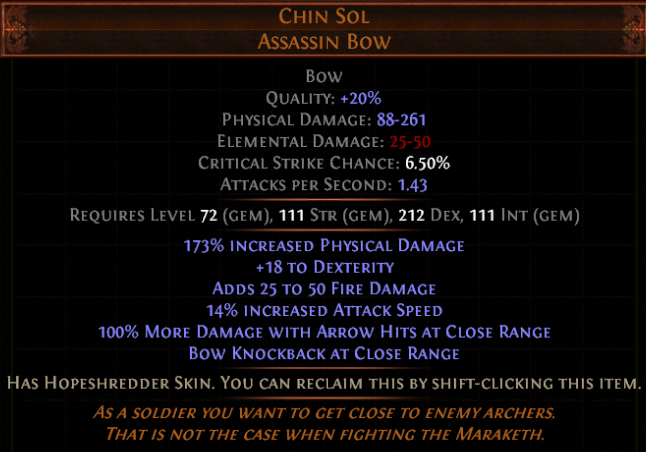 We utilize Chin Sol to take advantage of the absurd damage on bosses it provides, while we swap to our +2/+3 gems bow for clear. Fortunately, Mirage Archer Support also provides us with an incredible amount of damage and leech, which gives us an incredible amount of freedom to reposition without loss of uptime throughout your battles. This is our recommended skill tree for the build. Since we already have plenty of damage, there is not much need to invest into Critical Strike; for this reason, we take Resolute Technique, ensuring accuracy is not an issue. The highest priorities will be to pick up Acrobatics and Avatar of Fire immediately, grabbing all the Life Leech nodes such as Vaal Pact on the way. You will need both Jewels very early on the left arm of the tree for your double_*Combat Focus*_ Jewels. Herbalism, Bravery, Blood Drinker, and Golem’s Blood are the first Life nodes to pick up, You should also acquire Lava Lash early for additional damage and penetration. Finish filling out the Life nodes before grabbing Celestial Judgement, which provides further damage for durable bosses. Pick up the Frenzy charges last, as additional icing for the build. For additional damage once you are into the 90’s, invest into the Attack Speed and Jewel socket near the Scion starting area, the Jewel socket above Acrobatics, or pick up the Holy Fire notable near Avatar of Fire. Unfortunately, there are no real easy ways to acquire Constitution and the “Wheel of Life” or Discipline and Training — any path typically results in multiple wasted points that are simply not worth the extra Life pool. Elemental Hit is the only skill we use to deal damage in this build. It is important to have two separate 6-linked weapons, or be using a 6-link chest such as Farrul's Fur, as Greater Multiple Projectiles Support is necessary for clearing, but a crippling disadvantage on single targets. Since we use a lot of Abyssal Jewels in items such as Tombfist and Bubonic Trail, this build does not have a lot of secondary skills or gems. Blink Arrow should be linked to Faster Attacks Support to help you get around the map quickly, and dodge dangerous boss abilities such as the Shaper Slam. Blood Rage and Decoy Totem have no need of being linked, but can be used as means of providing additional damage and defense to your build, particularly on bosses. Since our available sockets and links are limited, we also combine our Cast when Damage Taken Support + Immortal Call link with our Vaal skill. Vaal skills do not trigger from Cast When Damage Taken, but still benefit from the Increased Duration Support gem that is part of the link. Vaal Skills can be adjusted to your preference, but we often recommend either Vaal Grace (clearing) or Vaal Cold Snap (frenzy charge generation for bosses). Fire Penetration Support is used here as this setup is typically only used for bossing, allowing you to significantly amp up your output. Vaal Cold Snap is mainly used for Frenzy Charge generation on bosses, but has little use for clearing. If you are farming a lot of maps, you can instead opt for Vaal Grace or Vaal Haste — both are superior options for clearing. These are recommended for bosses, or once you have adapted the build for Frenzy Charges. You can also use this as another Vaal link, such as either Vaal Haste and/or Vaal Grace. The sockets do not have to be linked. Pathfinder is an optional choice here, but the most recommended for this build as it excels at dealing with tough bosses. Raider is another great option and superior for general mapping, offering the fastest clear speeds. Ascendant gives us a lot of unique options when approaching this build. Slayer Ascendancy, in particular, is a large power spike and an essential part of our defense. Combined with the Leech Nodes on the tree, we can achieve up to 46% of Life Leeched per second, which is an incredible amount of defensive potential when coupled with the overleech Slayer provides. This can be further increased using Soul of Arakaali, upgraded with Captured Soul of the Arachnoxia, further increases this overleech via our Hematophagy notable. This is reliably activated by our low level Immortal Call in our Cast when Damage Taken Support link while Blood Rage is active. All told, an incredible amount of overleech is possible and it can last for a significant duration of time, which makes the build feel especially great while Delving, as you can venture around in the darkness for some time while the overleech sustains you. The Culling Strike is an added bonus, and feels great on beefy bosses. Path of the Duelist is necessary for us to reach Avatar of Fire and Acrobatics while still acquiring all the damage and Life we need. There is not a great deal of reason to attempt this build before this node is acquired, as you will have neither the points necessary to reach the mandatory keystones and notables nor the correct starting position on the passive tree. Fortunately, you can easily level Scion as a completely different build and the Slayer Ascendancy will still be of high value throughout the leveling process. Pathfinder Ascendancy is the best choice for finishing the build if Uber Elder, Shaper, or other boss hunting will be your focus. The elemental penetration and flask empowerments are very powerful tools and should not be undervalued. Raider Ascendancy is the best choice for finishing the build if clear speed and maximum experience per hour is your focus. The organic Frenzy Charge regeneration is also a nice quality of life bonus for some bosses, and allows for Vaal Cold Snap to be completely dropped in favor of another Vaal skill. Kill all three bandits for the Passive Points. Soul of Arakaali: Upgrade as soon as possible with Captured Soul of Arachnoxia from Toxic Sewer. The other upgrades are all generally useful defensively, and worth seeking out, but not necessary. Minor Gods are a matter entirely of preference, so feel free to choose based on your personal liking. Soul of Shakari’s reduced Chaos Damage is our preference, and the Poison Immunity acquired from the Captured Soul of Terror of Infinite Drifts (Desert Spring) is one of the best upgrades in the Pantheon. 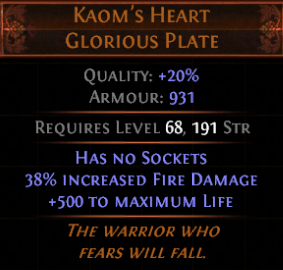 Kaom's Heart is the only real choice for bossing and the end-game, as we have no real need of a second six link due to our use of Chin Sol. 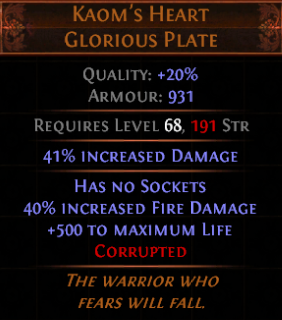 As we deal exclusively fire damage, this unique is perfectly suited to both offense and defense. 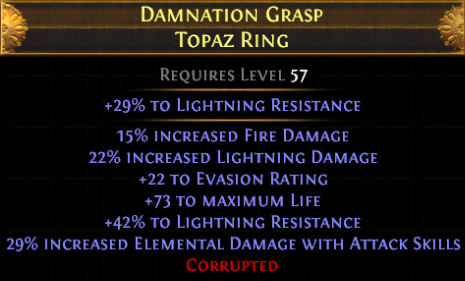 There are also some very nice corruptions possible, such as the increased damage or increased maximum resistance. 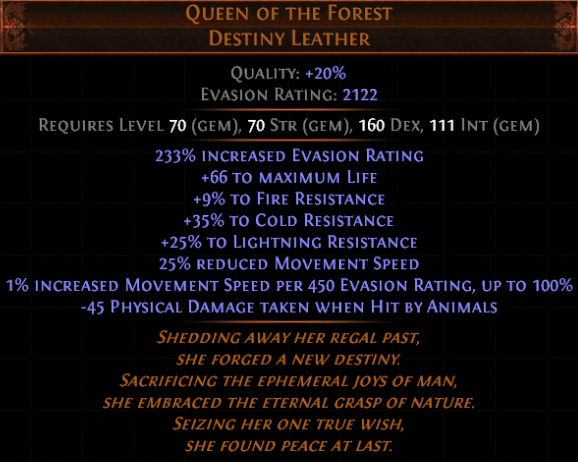 Queen of the Forest is another option for clear speed and general mapping. It can acquired before Kaom’s and used earlier in the league. Bubonic Trail are the best option available, offering a very high amount of life (including the jewel sockets) and excellent move speed. The damage bonus per each type of abyssal jewel is significant, as we use all four types within the build. 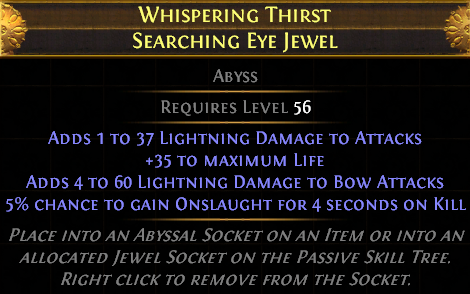 A one socket version is fine early on, as we can still get all four types of Abyssal Jewels using a Stygian Vise. Tombfist are simply the best choice in the current metagame, especially as users of Bubonic Trail. The massive amount of Life and built in Maim and Intimidate are simply too good to pass up, in addition to the damage they provide. 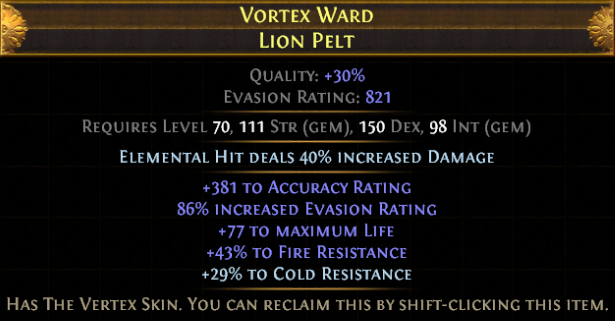 A rare helmet with Life and resists is typically the best choice, as we are already using a lot of uniques in other slots. 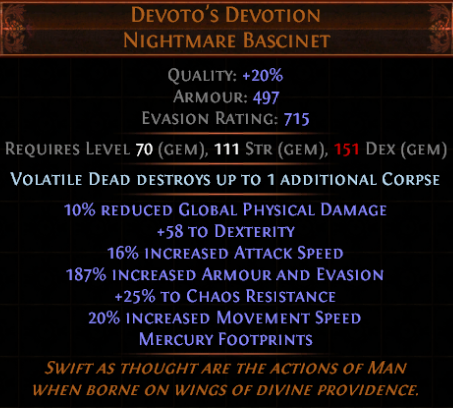 Devoto's Devotion is an option for clear speed if you cannot afford the Abyss gear yet, as you can use Rare boots instead for resistances. This bow is easily and cheaply crafted using The Porcupine Divination Card, a set of 6 that turns in for a 6-Link Short Bow (item level 50). Use a Shrieking Essence of Rage onto the bow to guarantee +2 Fire Gems. Shrieking Essences of Spite and Sorrow can also be used, as Elemental Hit is counted as a gem of every element. Craft Attack Speed onto the bow if it isn’t rolled already. These are the main two stats that matter; in particular, the +Level to gems has a massive effect on Elemental Hit’s damage. You can later upgrade this to a +3 gems bow by ensuring it has 2 prefixes and 2 suffixes. Craft the “Cannot Roll Attack Mods” Master affix onto the bow, then use an Exalted Orb on it (guaranteed result). Chin Sol is the best option, allowing for some exceptional damage output and overleech. 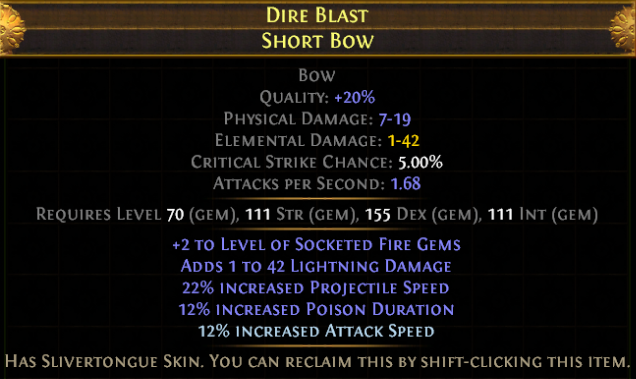 This bow is preferred as a weapon swap, as it allows us to use different colors for our Elemental Hit 6-Link, dropping Greater Multiple Projectiles Support in favor of Fire Penetration Support. Combined with Point Blank, this weapon will decimate bosses. A corrupted Drillneck with Point Blank is a highly effective option combined with Chin Sol. The corruption is not necessary, but a useful upgrade to pursue once you have the currency, saving you a Passive Point as well as allowing you to play without Point Blank when you are using your clearing weapon. For your clearing weapon, a variety of options are suitable. Rigwald's Quills is exceptional for clear, but extremely expensive. Shaped Quivers are also great options to consider, but also require currency. Using a second Drillneck, or simply swapping your quiver between weapons, is perfectly fine as well; you will not notice much difference when clearing as nearly all enemies will be instantly obliterated regardless of your choice. Yoke of Suffering is used in this build. providing solid damage and valuable resistances. Since Avatar of Fire is not too far out of our way, Xoph's Blood is not necessary. The primary stats it provides are also quite valuable to our build, as we run low on Strength and Intellect, especially. 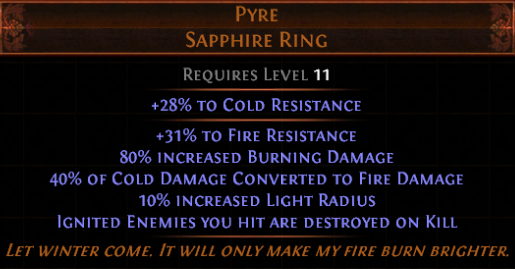 Pyre is used in one of our Ring slots in all situations. A Rare with Life, Resistance, Elemental Damage with Attack Skills, and Fire Damage. As we use Resolute Technique, Critical Strike has no benefit for us, which can make finding a powerful ring significantly cheaper. 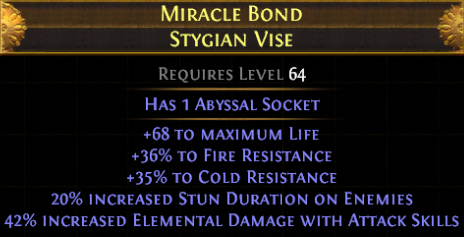 A Rare Stygian Vise should be used with high Life, Resistances, and Elemental Damage with Attack Skills. 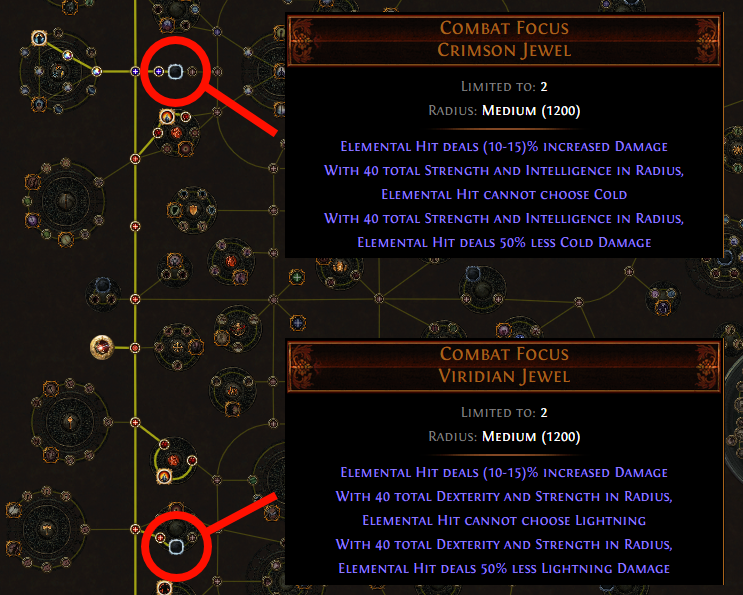 You will require two Combat Focus Jewels to ensure Elemental Hit always chooses Fire. They should be slotted in the left part of the tree, near the Marauder and Templar starting zones. 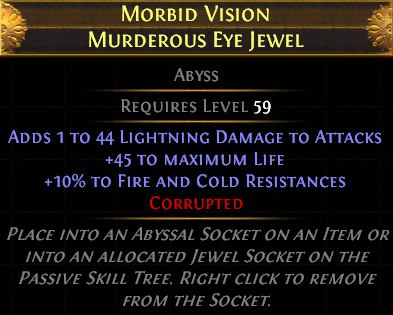 You will want to use one of each type of Abyss Jewel for the bonus from Bubonic Trail, and a second Searching Eye Jewel for the Bow mods. 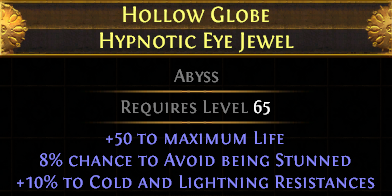 Resistances on Jewels is very important as the build incorporates a large number of Uniques; the Abyss Jewels allow us to recoup resistances that cannot be obtained from Armor slots. 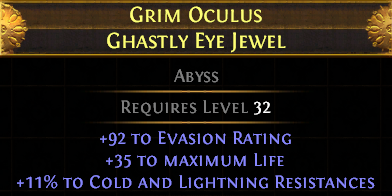 Having Onslaught on at least one Jewel is a very nice bonus to clear speed. Can I Level as Elemental Hit? While it is, of course, possible to level using Elemental Hit, it is not recommended. If you are set on playing a Bow build throughout the entire leveling process, it is advised you instead use Rain of Arrows, for example. It is generally easiest to level with a melee skill with high base damage, such as Blade Vortex, so you can acquire the life and tankiness surrounding the Marauder starting area. Our Ascendancy allows us to play nearly any build to great effect, so do not feel any rush to respec into the full Elemental Hit build until you have the levels and currency to support it. Can I Make This Build Work With Only a Single Weapon? It is difficult to play this build to any level of effectiveness without using a Chin Sol weapon swap, which rely on for our powerful single target damage and overleech. Being able to have two differently colored 6-links is also a huge advantage, allowing us to use Greater Multiple Projectiles Support in our clearing link while maximizing our boss damage with Fire Penetration Support in our Chin Sol. You should obtain a 6-link clearing bow before aiming for 6-link Chin Sol, as it can be more easily obtained by using the method described in the Weapons section of the guide. Which Map Mods are Most Difficult? Elemental Reflect is not possible using this build, and should always be avoided in any circumstance. No Leech is a risky mod to attempt, but possible with patience and good flask play. Monsters have 90% chance to Avoid Elemental Ailments is an inconvenient affix and should be rerolled if you can spare the currency. Which Bosses are Most Difficult? This will vary from player to player, but I find Guardian of the Phoenix to be one of the most dangerous, especially with turbo mods or increased area of effect. The general zoning of the boss makes abusing Chin Sol a difficult game plan, and the phoenix’s, which can easily stun you with their damage, must be periodically cleared using your Greater Multiple Projectiles Support bow. The phoenix’s can be very dangerous if the map is rolled with additional projectiles mods, and should be cleared immediately. 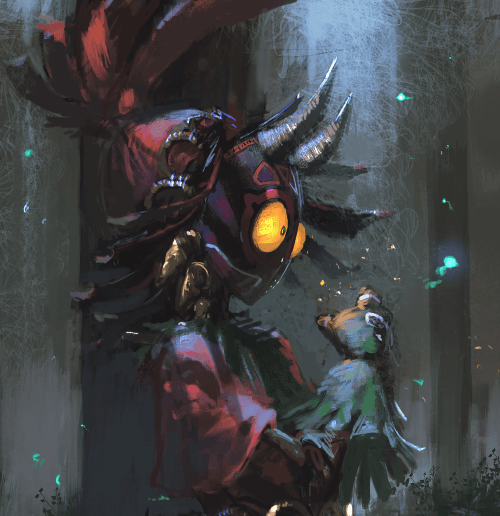 Guardian of the Phoenix can be dealt with safely and easily, but it must be played more slowly and patiently than most bosses. How Do I Approach Uber Elder? Uber Elder should be played very aggressively, as most of our defense relies on the powerful overleech we sustain through our Chin Sol damage when we are right next to the target. This build can push through phases quickly, and afford to make a few mistakes, but it can still be easily one-shot if you are unfamiliar with the mechanics of the encounter. 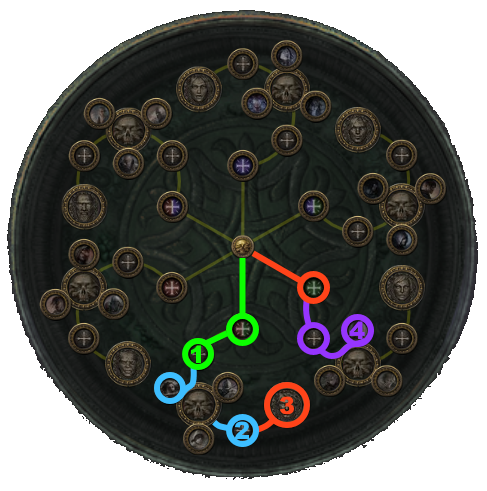 Using Kaom's Roots will reduce your damage, but remove possible RNG overlaps between Shaper and Elder’s mechanics that result in one-shots. If you do die during the encounter, you will need to be very careful when re-entering the fight, as your powerful overleech will not be ticking and you can die very quickly to some of the ground effects. When dealing with null portals and adds, try to move in a circular pattern around the top half of the arena to allow you to continually dodge Shaper orbs without having to pay much attention to them. 17 Apr 2019 Removed references of the old Forbidden Masters crafting system. 21 Feb 2019 Small fixes. 07 Jan 2019 Added new videos for Aul, the Crystal King (Depth 350) and a full Pit of the Chimera run! 03 Jan 2019 Added an "About the Author" section. I’ll look into it, although this build is not really viable to level using Elemental Hit. I’d recommend leveling with Arc, either self-cast or Saboteur, and respeccing once you have the necessary currency. I played this build from league start as Slayer/Sunder and respecced at 92 (horrible decision in retrospect). You could also level it as a bow build using Rain of Arrows or Tornado Shot if you’re really set on playing a bow build. Basically, the choices for leveling this kind of build are pretty broad since the passive tree and skills we used for the end-game simply don’t work very throughout the early game. Can i use Dying sun flask instead any common flask when farming maps with The Wise Oak? Swap out the Quartz if you want to use Dying Sun. It’s great for clear, especially in the larger/more open maps.